Raymond M. Demere enlisted at an unknown date with the 2nd Battalion, Georgia Vol Cav. Demere transferred April 3, 1862 in Bryan County with Capt. J.L. 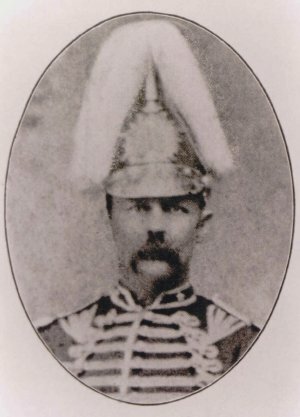 McAllister in the Hardwick Mounted Rifles. He was commissioned 2nd Lieutenant on January 24, 1864. He served with the HMR until, through consolidation of units, he was transferred to Co. K, 7th Regiment, Georgia Cavalry. In early June, Lt. Demere requested forage for 79 horses. On July 1st, he asked for forage for 19 horses, along with 3268 lb. corn and 1478 lb. oats. Also in July near Rocky Creek Station, Va. he gave the number of men in Co. K which was; 1 Captain, 1 Lieutenant and of NCOs and Privates, 24. October was the first indication as to his promotion to 1st Lieutenant. Company K's Capt. Quarterman was wounded by a gun shot September 29, '64. He received on October 20th a 60 days leave of absence to Bryan County. At this time Lt. Demere became Cmdr. of Co. K. In this same month, Lt. Demere requisitioned forage for 5 horses (which appears to be those of Co. H). On the same date, another was made for 13 horses. Lt. Demere also requisitioned for the needs of the camp and the men monthly. The first of December was the last one on record. He may have been one of the 200 men who went to Georgia to acquire horses. He was captured near Savannah on January 2, 1865. He was sent to Hilton Head, S.C., Transferred to Washington, D.C. on February 1, 1865 then transferred to Ft. Delaware on February 7th. No additional details.